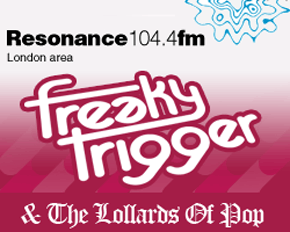 Freaky the Trigger and Her Pop Lollards round off their run with a final show whose contents will come as no surprise to those with a keen sense of the Lollardry ethos. It’s a clip show, in other words. Kind of. Tim, Meg, Steve, Tom, Elisha, Mark, Magnus and Pete test the physical limits of the studio — this is science, after all — by all crowding round the mixing desk. The missing link between King Arthur’s round table and Jay-Z. “How We Do” by Trina feat. Fabolous (not the other way around). And on it goes. Until it stops. At least they didn’t call you zany! Sorry Kat. I didn’t get an adjective, probably just as well! A considerably messier show than most, full of self regarding nonsense. A lot of fun in the studio though, and we hope it comes through on the podcast. When you say we, do you mean me? I think we answered her question perfectly. Belated thanks for the shout out (assuming you meant me). I was listening ‘live’ at that point, as it happens.